Justin Vest and other members of Hometown Action are hosting a #FamiliesBelongTogether Potluck in Athens, AL on August 26, 2018. To attend or host a cookout in your hometown, click here. This summer, people gathered in cities throughout the country to protest our government’s separation and incarceration of immigrant families. In Alabama, hundreds of local residents came together in Birmingham, Montgomery, and Dothan. It was only the Huntsville rally that made national news — after an armed counter-protester attempted to disrupt the event. Whether explicitly stated or not, the narrative was the same: A white Trump supporter threatening violence came to epitomize Alabama’s stance on immigration. It’s a convenient narrative that plays into the hands of anti-immigrant policymakers, who’ve been using Alabama to justify harsh immigration policies for years. In 2011, Alabama passed the notorious HB 56, the harshest anti-immigrant law in the country. It required schools to determine the immigration status of students, barred undocumented immigrants from working or renting housing, gave local law enforcement authority to verify immigration status, and criminalized certain actions by individuals and charitable organizations — including transporting immigrants to the doctor or grocery store. Some of these provisions were struck down following legal challenges, but many of the most egregious elements are finding new life at the federal level. Secretary of Education Betsy DeVos recently said schools should be able to decide whether to report undocumented students to ICE. And Jeff Sessions’ new “zero tolerance” policy and a series of procedural changes have taken the spirit of Alabama’s original HB 56 nationwide. What gets ignored is the actual attitude of Alabamians toward immigrants. The majority of Alabamians aren’t uneducated racist bigots in lockstep with President Trump’s agenda. Yes, Trump won 62 percent of the vote in Alabama, but 36 percent of eligible voters weren’t compelled by any candidate to turn out to vote. Taken together with those who voted against him, Trump only won 39 percent of the total Alabama electorate. Among those who voted for him, an even smaller margin supports his every move. As a native of Alabama who grew up in small towns, this isn’t news to me, but the rest of the country needs to know as well. 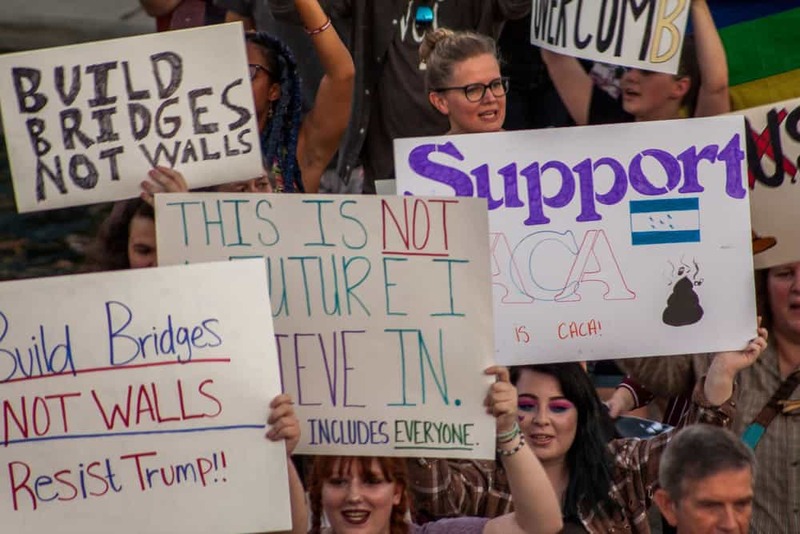 The fact that hundreds of people attended numerous rallies across Alabama in support of immigrants should be evidence enough. The crowds may not have broken any records, but in a state that’s predominantly rural, it’s a big deal. Volunteers with Hometown Action, a new group organizing a multiracial constituency of working class people in small towns and rural communities, have knocked on thousands of doors throughout Alabama. They’re asking about which issues matter most to local residents, and who they believe is responsible for their problems. Even in some of the most conservative counties in the state, we found that most people don’t blame immigrants for their problems — even if politicians do. Most people understand it’s the politicians and their wealthy corporate donors — industries that also exploit the resources of Latin American nations, the labor of immigrant workers, and profit off the incarceration of children and their families — who are responsible for their day-to-day struggles. These are the same kinds of people who profit off the opioid crisis, replace good-paying jobs with precarious low-wage work, and who limit the opportunities of our children by underfunding our public schools. I’m sick and tired of my people — working-class white people and small town Alabamians — being used by politicians as justification for these atrocities. Alabamians are standing up for immigrants, and it’s time to change the narrative about who we are.